Bacardi Razz, along with others brand of raspberry rum, is one of the more versatile fruit-flavored spirits. Its potent, sweet-tart raspberry flavor, which in Bacardi Razz is actually a citrus-raspberry blend, pairs perfectly with most other fruit flavors, particularly other berries and citrus, along with tropical notes like coconut. Bacardi Razz is quite at home putting its berry twist on most traditional rum-based cocktails, from dressed-up tiki drinks to big-batch rum punches. You can go all-in on the berry flavor (include fresh berries too for an antioxidant boost with your booze) or tone it down with a single complementary mixer. Experiment a little with your bottle of raspberry rum and discover all its possibilities. Add a shot of raspberry rum to an ice-filled glass, top it up with a single non-alcoholic mixer, whether soda, juice or another soft drink, and you have a delicious mixed drink with minimal effort. Cola, lemon-lime soda and ginger ale, whether diet or regular, all work perfectly with raspberry rum. Soda water and flavored soda waters add refreshing fizz without a lot of calories, as does coconut water. 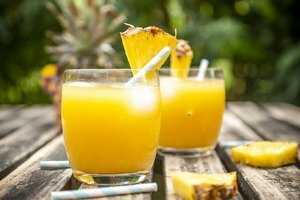 You can go two different ways with fruit juice: make a rum sour with just raspberry rum and fresh lemon, lime or grapefruit juice; or stay on the sweet side with orange, pineapple or blended juice. Cranberry juice is a great mixer for raspberry rum, offering a pleasing sharpness to balance the sugary rum. Raspberry and lemon are firm friends, so raspberry rum is an ideal choice for a homemade hard lemonade. Simply use pre-made lemonade as a mixer, and add plenty of ice. You might include fresh or frozen raspberries (or other berries) in the mix, and perhaps some fresh mint leaves. Pink lemonade is a nice choice, as well. If it's too sweet for your tastes, make an adult Arnold Palmer by using half lemonade, half iced tea. You might also concoct a frozen version of this already-cool, summery drink. A traditional mojito features fresh, muddled mint leaves, a little sugar, fresh lime juice and a splash of soda water along with rum. If you substitute raspberry rum, cut out or reduce the sugar, as the flavored rum is already quite sweet. A similar drink is a daiquiri, which uses lime juice, rum and usually simple syrup. Again, eliminate the syrup or add just a little to taste when you're using raspberry rum. 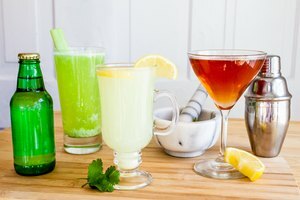 Both of these cocktails can be the basis for delicious frozen drinks. Include a handful of frozen or fresh berries along with the ice. 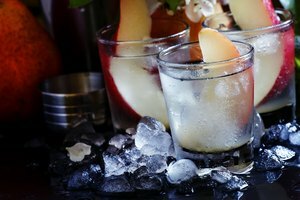 Other fruits, such as pineapple, peaches and kiwis, can also make delightful raspberry rum-infused versions of frozen daiquiris and mojitos. Another fun tiki drink you can make with Bacardi Razz is a pina colada, with the raspberry flavor joining pineapple and coconut. Substitute coconut water for the traditional coconut cream for a lighter version. Travel from the tropics to New Orleans with a hurricane, usually a mix of white and dark rums, lime juice, orange juice, passion fruit juice, a little simple syrup and grenadine. Simply skip the simple syrup and substitute Bacardi Razz for some of the rum. A rum punch is like a choose-your-own-adventure mixed drink, so raspberry rum can be easily featured along with any other types of rum, fruit juices, sliced fresh fruits and other accent ingredients you enjoy. Getting the ratios right is key, so take guidance from the following saying from Barbados: "One of sour, two of sweet, three of strong and four of weak." 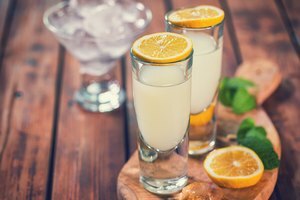 The sour usually refers to lime juice, the sweet to simple syrup, the strong to rum and the weak to water. Use raspberry rum as just a portion of the requisite three parts, using non-flavored rums for the rest, otherwise it will dominate the punch. The water might instead be soda water, flavored or plain, sparkling wine or a mixture of different fruit juices. If you do use juice, cut out the syrup or the punch will be too sweet. A Barbados rum punch includes a little grated nutmeg and dash of bitters, so consider adding these elements, too.